A larger than life reproduction of The Two Fridas by Frida Khalo commands the stage during the overture of Atom Egoyan’s highly symbolic interpretation of Mozart’s Così fan tutte. The opera’s title can be loosely translated as “they are all like this” and it’s a battle-of-the-sexes play wherein a cynical bachelor sets out to prove that all women are too fickle to be capable of fidelity. In the Canadian Opera Company’s current production, the curtain comes up on a science lab in a prep school. The class is led by Don Alfonso (Thomas Allen), an inveterate bachelor. He convinces two young gentlemen, Guglielmo and Ferrando to enter into a bet as to whether their fiancées can be persuaded to be unfaithful. The young men are convinced of the virtue of their ladies, Fiordiligi and Dorabella, so they accept the bet with confidence. This opera is a merry farce and one of the finest examples of the opera buffa style. Despite the lighthearted tone of the score and libretto, Egoyan effectively uses symbolism to shade some of the more complex social subtext at work in the opera. In addition to the Khalo painting, pinned butterflies are a recurring symbol, with several stunning, large-scale ones gracing the stage. The set was visually arresting, albeit somewhat less lavish than sets that have been used in other COC productions. The costumes were likewise arresting. The white, prep school kilts and blazers worn by the ladies and the chorus members provided a sharp contrast to the vibrant colours of the butterfly motif. 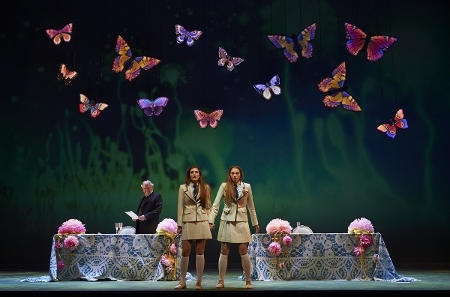 Egoyan made the decision to keep Fiordiligi and Dorabella in the prep school attire throughout the entire performance. While this choice was undoubtedly made to serve the symbolic vision of the piece, it felt somewhat monotonous by the end of show. The cast was comprised of a mix of seasoned veterans and rising stars. The role of Fiordiligi was interpreted by young Canadian soprano Layla Claire. Ms. Claire possesses a vibrancy of colour and a natural agility that is tailor-made for the florid singing required for this role. She interpreted the role with a sweetness of tone that was in no way lacking in strength and richness. Mezzo-Soprano Wallis Giunta was also superb in the role of Dorabella. Her tone is reminiscent of deep silver bells and is a perfect complement to Ms. Claire’s. Their duets can only be described as sublime. Arguably, a significant amount of the enduring success of this work can be explained by the role of Despina. She is the personal maid of the two young sisters and in cahoots with Don Alfonso to entrap the young noblewomen into committing an indiscretion. Despina has some of the most timelessly hilarious and witty lines in this work and the role can only be carried off by one who is as gifted a character actor as they are a singer. Tracy Dahl demonstrated herself to be a master of physical comedy and comedic voices whose talent in this regard is not likely to be exceeded by theatre-trained actors. The COC is also fortunate to have Sir Thomas Allen in the role of Don Alfonso. His rich baritone and easy-going style are ideal for the role of the playful antagonist. I would highly recommend Così fan tutte to opera newcomers. Egoyan’s production effectively uses symbolism to add a little more substance, without detracting from the frothy good time that makes this classic a gem. Show times are 7:30 PM on January 24, 29, February 6, 7, 15, 18, & 21 with additional matinees on February 9 at 2 PM and February 1 at 4:30 PM.